A centre which offers free advice to small and medium-sized enterprises (SMEs) has opened its first branch in the heartland. 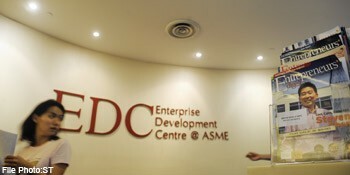 The Enterprise Development Centre at North East, which is located at the Tampines headquarters of the North East Community Development Council (CDC), is the sixth centre by the Association of Small and Medium Enterprises. The other five are located within trade organisations. The new centre, officially unveiled yesterday by Mr Teo Ser Luck, mayor of the North East District, aims to help smaller SMEs to be more efficient and to take advantage of government assistance schemes. "A lot of our heartland stores and businesses...do not know about our schemes," said Mr Teo, who is a Member of Parliament for Pasir Ris-Punggol Group Representation Constituency. "This is one of the ways in which we can close those gaps in our outreach efforts," he added.